If you were excited about the opening night party at St. Gregory’s Castle, this news is really going to WOW you! The menu and food for the evening is being prepared and served by the famous restaurant El Celler de Can Roca. El Celler de Can Roca is located in Girona, and was founded over 25 years ago by three brothers. Joan, the oldest brother, is the head chef. Josep, the middle brother, is the sommelier. And Jordi, the youngest brother, is in charge of desserts. 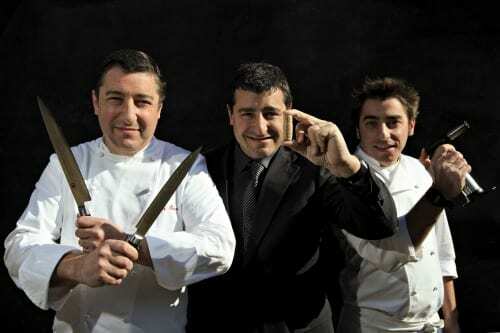 The three brothers have combined their talents in creating a restaurant honored with three Michelin stars. But forget about the stars – perhaps even more noteworthy is that for the past two years El Celler de Can Roca has been named the second best restaurant in the world by British magazine, Restaurant. This ranking is bestowed by vote of a panel of international chefs, restaurateurs, gourmands and restaurant critics. In other words, the very people associated with quality dining. So get your taste buds prepared for a taste of their life time. See you at St. Gregory’s Castle on Thursday night. Note: For those of you are asking yourself, well, if El Celler de Can Roca is the second best restaurant in the world, what is the first? The answer is Noma, located in Copenhagen, Denmark.